Assigned status Up to Date by Derek W DelMonte, MD on November 8, 2018. Emmetropia or no refractive error is the ideal outcome sought, in accordance with which maximum biometry is carried out. However, in certain circumstances some may benefit from either a hypermetropic or myopic status postoperatively. In cases where the patient prefers a certain refractive state for either occupational or social needs, including low vision aids. Some-times the other eye refractive state has to be considered, as in cases of monovision or anisometropia, which should be kept less than 3 diopters. Defined as the electronic amplification factor of the sound waves received by the transducer, it is measured in decibel (dB). Normal setting is around 70% -75%. But it may be increased where high echoes are inadequate (hard cataracts, dense ocular opacities, high myopia). It is decreased when artifacts are seen near the retinal spikes (silicone filled eyes & in pseudophakics). Formula for calculation of IOL power have been evolving since their inception in the 1950s. These can be classified on the basis of their derivation (theoretical, regression analysis or combination) or according to their evolution as per generations. By derivation, theoretical formula are determined by application of geometrical optics to the schematic and reduced eyes using various constants. Later; regression analysis using the actual post-operative results of implant power as a function of the variables of corneal power and axial length were derived. Sanders, Retzlaff and Kraff developed the SRK formula which was widely used. Though now replaced with the newer generation formula, it is still useful for understanding the relation of the variables and A-constant to the IOL Power (P). P = A – 0.9 K – 2.5 AL This is rarely used to calculate IOL power manually where other tools are not available, but should be avoided whenever possible. The various generations of formula are discussed under the “Mathematics and Measurements” subheading. The only variable which cannot be measured pre-operatively is ELP and most of the later day formulae like Holladay, Hoffer Q, SRK/T or Haigis attempt to calculate ELP more accurately. The newer modifications have continued since, but the improved accuracy of post-operative refraction is also due to increased surgical proficiency and cataract techniques over the years. Example being the Holladay 2 which uses patient age and preoperative refraction as further variables to improve accuracy; while Haigis replaced K with preoperative ACD to improve accuracy. See figure 1, for diagrammatic correlation. The ELP in the original formulae was a constant, as the lenses used were mostly in the anterior chamber. Hence this was incorporated into the “A” constant in the later regression analysis like SRK. Today, the newer formulae generally use only one constant incorporated as A-constant or Surgeon Factor (SF). The original A-constant developed in the 1980s was so widely used that every lens was designed with a specific A-constant by the manufacturer. Even though regression analysis is not recommended today; the A-constant still remains due to its benefits in emergency usage and manual derivation for confirmation. It is considered the second most important factor for IOL power determination. Changes in K reading; alters the IOL power in a ratio of nearly 1:1. It can be measured either by keratometry or topography but neither measures the actual corneal power directly. The mathematical principle behind the keratometry method is that the central cornea is assumed to be a perfect sphere and acts as a spherical convex mirror. Further the posterior corneal curvature is assumed to be 1.2mm steeper than the anterior; this is especially altered after refractive surgeries due to which increased errors are observed. From the size of the reflected image from the cornea acting as a convex mirror, the radius of curvature is determined, which is then converted to power in diopter or mm. n = Refractive index of medium 1 & 2 respectively. Topographical methods use the Scheimpflug principle via the Pentacam or the Galilei (double Scheimpflug) to measure the anterior and posterior radii of corneal curvature along with the corneal thickness which is then used to measure corneal power in diopters. In a normal phakic eye the average anterior corneal radius of curvature is 7.5mm, which corresponds to 44.44D using keratometric refractive index of 1.3333(4/3) which was found to be more accurate than the older one used 1.3375. The posterior corneal radius of curvature averages 1.2mm less than the anterior surface radius. Average velocity of a normal phakic eye is 1555 m/s. Ultrasonography methods can be applanation or immersion, the former is more inaccurate due to indentation, but the latter has less control. The A –scan (Amplitude modification) is a one dimensional display in which echoes are represented as vertical spikes from a baseline. Optical Methods use partial coherence laser for AL measurement. Similar to ultrasonography, optical methods also measure time needed for infrared light to travel from cornea to retina, but uses interferometry principle in order to avoid the problem of very high light speed measurements. As it is a non-contact procedure, no indentation errors occur. Two main instruments are available for optical methods IOL Master from Zeiss and the Lenstar from Haag-Streit. It has been reported that there are no statistically significant difference in the measurement of AL by IOL Master, Lesntar and immersion ultrasonography by Montes- Mico. Average AL in a normal phakic eye is about 24mm in adults. Optical methods of measuring AL need more elaboration as compared to immersion ultrasonography. The problems in pediatric age, especially the very young; includes the increased errors in AL measurement, which compounds the final IOL power errors due to shorter AL. AL and K value must be measured under general anesthesia. The IOL power chosen should allow good vision in growing age to prevent amblyopia and ideally also give emmetropia in adult age. Currently all infants above two months are advised IOL implantation. The greatest concern at such an early age is to prevent amblyopia. The development of the eye necessitates initial under-correction to avoid later myopic shift. The growth of the anterior segment is usually completed at around two years hence the IOL aimed for is about 80% of the calculated amount of power. The major issue is with silicone filled eyes after vitrectomy in which IOL implantation is being considered. The velocity of sound in silicone is slower than in vitreous which must be corrected for measurement of the AL accurately. The two most common types of silicone have different tissue velocities, 1050 or 980 m/s; hence one must know which velocity to select to avoid a small mistake in axial length.This is usually achieved after alteration of settings in the newer machines. Moreover silicone in the eye itself acts as a negative lens when a biconvex IOL is implanted hence the IOL power must be adjusted by 3-5 D. Measurement adjustment to improve accuracy can also be achieved by calculating each segments ratio and then obtaining the IOL value by appropriate alteration. Measurement of AL by optical method has been found to much more accurate for silicone filled eyes. Corneal Refractive surgeries alter the basic assumptions on which the biometry for IOL calculations is based – namely the perfectly spherical nature of cornea. The refractive surgeries mainly affect the central cornea, as well as alter the posterior corneal curvature, which is not routinely measured. The errors occur due to instruments, index of refraction and formulas used. Instrument errors occur due to the inability of keratometers to measure the central zone of effective corneal power. While they measure a 3.2mm zone diameter, this misses the central effective zone. Flatter the cornea, greater the measurement zone hence greater the error. Refractive index (RI) is based upon the ratio between the anterior and posterior corneal curvatures. As may be recalled most instruments only measure the anterior curvature while making assumptions about the posterior curvature to derive at the RI, hence K. The relationship between the curvatures is altered in PRK, LASIK & LASEK, but avoided in RK which causes alteration of curvatures such that the relation is maintained. This overestimates the corneal power by 1D for every 7D of correction of refractive error. So named because they utilize measurement apart from post-refractive surgery corneal power reading. Stabilized refraction after keratorefractive procedure. The stabilized refraction must be measured before changes in refraction occur due to cataractous alterations. It is most accurate as the pre-op values are precise up to +/-0.25mm . The limitation is the reliability of refraction in the patient with cataract . Based on theoretical studies by Feiz, Latkany and their colleagues, various nomograms were developed after calculating IOL power post LASIK with SRK/T and three other formulas. The change in the spherical equivalent after LASIK was used to modify the IOL power. Its main limitation is the theoretical nature of the study and the lack of large published data with regards to its accuracy. It directly uses intraoperative refraction data to calculate the IOL power, without need of knowing AL and K. A special “A-constant” is formulated for the same. Main limitation is the lack of support by large data studies . 0.7D change at spectacle plane = 1.0D change at IOL plane. This co-relation is then used to obtain the IOL power post refractive surgery . So named as one actually measure the corneal power post-operatively to calculate the effective keratometric dioptres. Although most modern devices do not directly measure the posterior corneal curvature, they use alternative algorithms to approximately assume the RI change induced or simply use different variables to predict ELP . To calculate the Effective Refractive Power (EffRP), the posterior corneal curvature is not directly measured but predicted from the data of Oslen et al. . EffRP was then used to predict ELP, along with the application of linear regression analysis . Errors of nearly 0.5 D are still noted. It uses the keratometric reading and the flattest corneal power in the central 3mm zone to calculate the simulated K (SimK). This is then used to predict ELP. Errors occur due to central zone giving steeper K values . This K reading then predicts the IOL power. Aramberri reported in 2002 that the flatter K should not be used in modern formulae. The pre-operative K is used to predict ELP while the post-operative K is incorporated in the formula for actual IOL power prediction. This was later incorporated in the Holladay 2 vergence calculation formula  . They reported a formula which uses induced refractive change as well as anterior and posterior curvature of cornea to predict IOL power. This uses a correction factor (R factor) for corneal radius which was derived from a regression formula and then compared with the calculation method and double K method. In their study of 19 eyes R factor was found to be superior when applied to the SRK/T and Holladay 1. The actual formula for IOL power is derived from manual measurements of corneal power (K) and axial length (AL). With the invention of these newer instruments direct measurement of the posterior corneal power is also possible, which then gives more accurate results for IOL calculation after refractive surgery. The Orbscan and the Pentacam both have been used to measure posterior corneal power, with the Pentacam having slight advantage. But these need more study and data  . Despite the various methods described, the science of IOL power calculation after refractive surgery is still in its nascent stages and needs more research. Generally calculation method is considered most accurate, followed by corneal topography and automated K.
It is extremely difficult to accurately predict corneal power in transplant patients. If a triple procedure is planned it is suggested that K readings of other eye be used. An alternative option is to use the average k readings from a series of previous transplants. If there is a corneal scar, but no graft is planned, other eye readings can be used or even the power calculated using AL and refractive error of affected eye  . Albeit not perfect, biometry for IOL power calculation can be made very precise, if one follows simple guidelines. All patients may not want emmetropia and some it may not be possible to ensure the same pre-operatively, as in very dense cataracts where macular lesions can be missed. Counselling the patient well is a must; who should be informed and then offered the options as per his/her needs. Each surgeon must review their own results and appropriately make alterations to biometry if needed. Regular checks and audits are a good habit. Training and monitoring the staff is equally important. While selecting the patient, ensure the eye and the papers are in order and correspond to each other. Cross checking with refraction is also a good adjunct if accurate retinoscopy is available. While performing the actual scan, ensure asepsis, especially in contact procedures. Patient comfort and appropriate anaesthesia should be monitored. Optical ultrasound is the gold standard for AL measurement due to ease of use, accuracy and reproducibility as well the non-contact nature of the procedure. As it cannot be accurate in certain conditions already seen, it can be supplemented with ultrasonography methods to improve outcomes. Immersion is preferred as it approaches the accuracy of optical methods, but is cumbersome to use. In cases where it is not available contact ultrasonography is still utilized. Appropriate machine calibration is necessary before the scan itself. Check A-scan graphs: If the spike from retina is not followed by multiple small spikes it means one is hitting optic nerve, so discard that reading. If there is a reading where the anterior chamber depth and actual length reduces, it indicates that in that particular reading one is compressing the cornea. It should be discarded. Gain should be the minimum possible which gives good spikes. Probe should be perpendicular, centred and pointing towards macula. Can be calculated by either using automated or manual method. Performing a double check by both methods helps in improving accuracy. Repeat if difference is more than 1.0D between the two eyes. Albeit controversial, some guidelines have been developed for which formulae to use under specific circumstances. Although earlier widely used, the SRK 2 and older ones now obsolete. Appropriate calibration of settings and adjustments of constants is a must before IOL power prediction. No single formulae has been found to be useful in all circumstances. As technology and patient expectation increases, one must continue to look to improve our own precision. Holladay IOL consultant (HIC) program uses Holladay 2 formula and performs complex power calculation for the surgeon. It has various other new features, but it still not widely available. Oslens’s formula uses pre-operative refraction and lens thickness for increasing accuracy. A new biometric computer program to stimulate whole pseudophakic eye aims to reduce calculation error and ensure a more reliable estimation of IOL strength. This approach separates the errors due to measurement and those due to calculation, helping us in correcting them better. The Pentacam and Orbscan have already been used widely for corneal ectasia, but are now beginning to be utilized for precise corneal power measurements. It has been suggested that manufacturers reduce the internal – tolerance levels of IOLs to +/- 0.25D, thereby increasing accuracy. However, these parameters are not routinely provided by manufacturers to clinicians. Many options are now available for references as well as direct IOL calculations. Some of these are listed below. The eye calculator software can be very useful in training institutes as it is usable offline as well. ↑ 1.0 1.1 1.2 Astbury N. and Ramamurthy B., How to avoid mistakes in biometry, Community Eye Health. 2006 Dec; 19(60): 70–71. ↑ Hoffer KJ. The Hoffer Q formula: a comparison of theoretic and regression formulas. J Cataract Refract Surg 1993;19:700–12. ↑ 4.0 4.1 4.2 Sahin A, Hamrah P. Clinically relevant biometry. Curr Opin Ophthalmol. 2012;23:47–53. doi: 10.1097/ICU.0b013e32834cd63e. ↑ Olsen T, Corydon L, Gimbel H. Intraocular lens power calculation with an improved anterior chamber depth prediction algorithm. J Cataract Refract Surg 1995;21:313–9. ↑ Lowe RF, Clark BA. Posterior corneal curvature. Br J Ophthalmol 1973;57:464–70. ↑ Montés-Micó R, Carones F, Buttacchio A, et al. 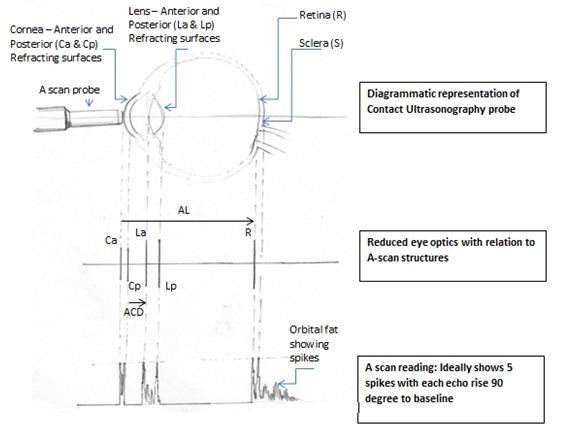 Comparison of Immersion Ultrasound, Partial Coherence Interferometry, and Low Coherence Reflectometry for Ocular Biometry in Cataract Patients. Journal of Refractive Surgery. 2011:1–7. ↑ Bhardwaj V, Rajeshbhai GP. Axial Length, Anterior Chamber Depth-A Study in Different Age Groups and Refractive Errors. Journal of Clinical And Diagnostic Research. 2013;7(10):2211–12. ↑ Haigis W, Lege B, Miller N, et al. 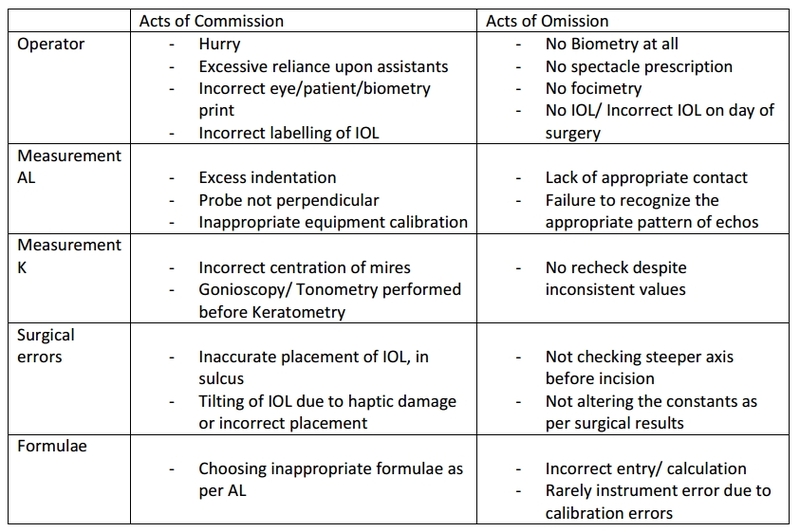 Comparison of immersion ultrasound biometry and partial coherence interferometry for intraocular lens calculation according to Haigis. Graefes Arch Clin Exp Ophthalmol 2000;238:765–73. ↑ 16.0 16.1 Rajan MS, Keilhorn I, Bell JA. 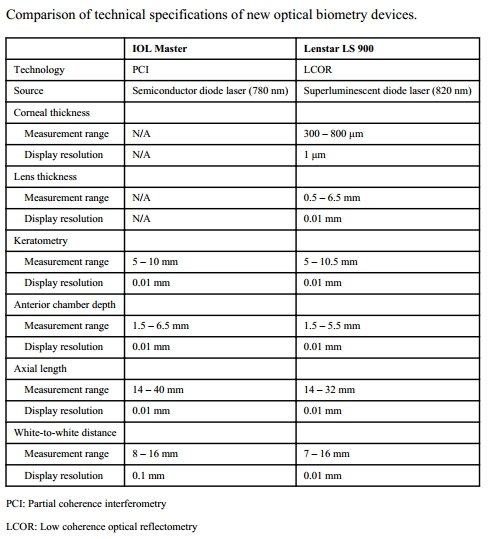 Partial coherence laser interferometry vs conventional ultrasound biometry in intraocular lens power calculations. Eye 2002; 16:552–6. ↑ Fedorov SN, Galin MA, Linksz A. A calculation of the optical power of intraocular lenses. Invest Ophthalmol 1975;14:625–8. ↑ Haigis W. Pseudophakic correction factors for optical biometry. Graefes Arch Clin Exp Ophthalmol. 2001 Aug;239(8):589-98. ↑ van Balen AT, Koole FD. Lens implantation in children. Ophthalmic Pediatr Genet 1988;9:121–125. ↑ Dahan E, Drusedau MUH. Choice of lens and dioptric power in pediatric pseudophakia. J Cataract Refract Surg 1997;23(Suppl.):S618–S623. ↑ Dahan E, Drusedau MUH. Choice of lens and dioptric power in pediatric pseudophakia. J Cataract Refract Surg 1997; 23 :618–23. ↑ Wilson ME, Peterseim MW, Englert JA, et al. Pseudophakia and polypseudophakia in the first year of life. J AAPOS 2001;5:238–245. ↑ Byrne SF. A-scan axial eye length measurements. Mars Hill (NC): Grove Park Publishers; 1995. ↑ Holladay JT. IOL calculations following RK. J Refract Corneal Surg 1989;5:203. ↑ 29.0 29.1 Haigis W. Corneal power after refractive surgery for myopia: contact lens method. J Cataract Refract Surg 2003;29:1397–411. ↑ Hamilton DR, Hardten DR. Cataract surgery in patients with prior refractive surgery. Curr Opin Ophthalmol 2003;14:44–53. ↑ Olsen T. On the calculation of power from curvature of the cornea. Br J Ophthalmol 1986;70:152–4. ↑ Hamed AM, Wang L, Misra M, et al. A comparative analysis of five methods of determining corneal refractive power in eyes that have undergone myopic laser in situ keratomileusis. Ophthalmology 2002; 109:651–8. ↑ Latkany RA, Chokshi AR, Speaker MG, et al. Intraocular lens calculations after refractive surgery. J Cataract Refract Surg 2005;31:562–70. ↑ Hoffer KJ. Clinical results using the Holladay 2 intraocular lens power formula. J Cataract Refract Surg 2000;26:1233–7. ↑ Aramberri J. Intraocular lens power calculation after corneal refractive surgery: double-K method. J Cataract Refract Surg 2003;29:2063–8. ↑ Camellin M, Calossi A. A new formula for intraocular lens power calculaton after refractive corneal surgery. J Refract Surg 2006;22:187–99. ↑ Rosa N, Capasso L, Lanza M, et al. Reliability of a new correcting factor in calculating intraocular lens power after refractive corneal surgery. J Cataract Refract Surg 2005;31:1020–4. ↑ Boscia F, La Tegola MG, Alessio G, et al. Accurac of Orbscan optical pachymetry in corneas with haze. J Cataract Refract Surg 2002;28:253–8. ↑ Prisant O, Calderon N, Chastang P, et al. Reliability of pachymetric measurements using Orbscan after excimer refractive surgery. Ophthalmology 2003; 110:511–5. ↑ Srivannaboon S, Reinstein DZ, Sutton HF, et al. Accuracy of Orbscan total optical power maps in detecting refractive change after myopic laser in situ keratomileusis. J Cataract Refract Surg 1999; 25:1596–9. ↑ Geggel HS.lntraocular lens implantation after penetrating keratoplasty. Improved unaided visual acuity, astigmatism, and safety in patients with combined corneal disease and cataract. Ophthalmology. t990;97(11): t460- 1467. ↑ Hoffer KJ. Triple procedure for intraocular lens exchange. Arch Ophtha/rnol. 1987; 105(5): 609- 610. ↑ Findl O , Menapace R. Piggyback intraocular lenses [letter].JCataract Refract SLlrg. 2000;26(3): 308~30 9. ↑ Findl O , Menapace R, Rainer G, Georgopoulos M. Contact zone of piggyback acryliCintraocular lenses. , Cataract Refract Surg. 1999;25(6):860- 862. ↑ 47.0 47.1 Norrby S. Sources of error in intraocular lens power calculation. J Cataract Refract Surg 2008; 34: 368–376. ↑ 48.0 48.1 48.2 Dr. Rajesh Kapoor, Dr. Ajay Dudani, Dr.Vinod Goyel, HIGH PRECISION BIOMETRY: Avoiding surprises in Cataract surgery ; Journal of the Bombay Ophthalmologists’ Association : Jan - Mar 2002 Vol. 12 No. 1. 9 Binkhorst RD. Intraocular lens power calculation manual. A guide to the author’s TI 58/59 IOL power module. 2nd ed. New York: Richard D Binkhorst; 1981. 10 Ram J, Pandav SS, Ram B, et al. Systemic disorders in age related cataract patients. Int Ophthalmol 1994;18:121–5. 32 Ianchulev T, Salz J, Hoffer K, et al. Intraoperative optical refractive biometry for intraocular lens power estimation without axial length and keratometry measurements. J Cataract Refract Surg 2005;31: 1530–6. This page was last modified on April 3, 2019, at 15:50. This page has been accessed 282,198 times.